I can’t even count the amount of times I’ve written here about the DIY projects my husband and I have done around the house- it is one of the most useful money saving skills that we have, especially in the long term, because each time we do something we save hundreds to thousands of dollars, which is a large chunk of money saved by being able to do things from scratch. But like with your kitchen, you can’t do DIY money saving stuff without tools. Just as I wrote a post about which tools the frugal kitchen needs to have to be able to save money, people have requested that I write a post about which tools you need to have in your house if you want to be able to start doing things yourself to be able to save money. As with my kitchen post, I’ll order it so that, depending on how much money you have available, you can invest in the necessary tools to be able to fix things yourself. I will add that I am not the expert DIYer in the family. That’s my husband’s role. Much of this post is based on things that I use or have used myself, or have learned from my husband after seeing him use them repeatedly. I also sat down with him and discussed his thoughts on what is necessary to be a DIYer and the order in which to prioritize them. Keep in mind my husband is not a professional, just a hobbyist who is very good at what he does, so what he recommends isn’t necessarily what a professional would recommend. For each tool mentioned, I linked to Amazon’s cheapest version of the item I was referring to. I don’t get kickbacks from any companies for this post, but I do want to mention that nearly every power tool my husband has is Stanley Fatmax or Worx brands and he is very, very happy with their quality. They are more pricey than the ones I linked to below, so if you have the money to invest, he’d recommend this brand. I do get a cut if you buy anything after clicking one of the links in this post, even if you don’t buy exactly what I linked to. If you are starting completely from scratch, never have done any DIY type stuff before, whether woodworking, plumbing, or electronics, buying everything you need, especially at once, can get pricey. Therefore, I’ve divided this into different levels, so that in each situation, as you have enough money to buy the next level, you’ll be able to DIY better and more efficiently. If you don’t have these in your home now, go get them immediately. Every home should have these, and these are not pricey at all. 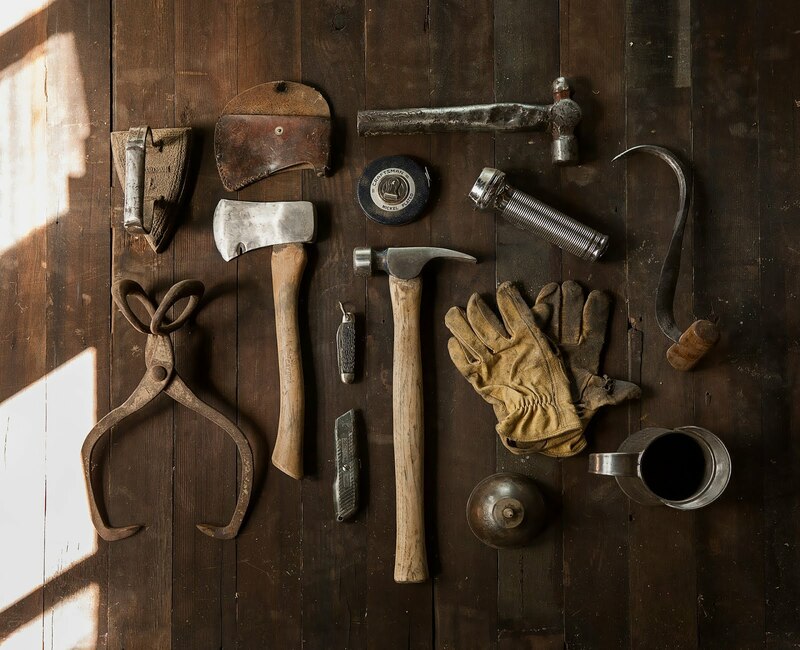 Hammers are very important, allowing you to build things with nails, take things apart, break things, etc… Make sure you get a claw hammer that will allows you to pull up nails. Nails also are very important. Ideally get in a variety of sizes. If you have the money to invest in a drill (lower on the priority list) and therefore can use your drill, you may find yourself reaching for the hammer less, but until you get to that point, nails are going to be your go-to building tool. Screwdrivers are very important as well. Make sure to get both flat head and Phillips screw drivers, and in a variety of sizes. Even if you don’t plan on doing any complex DIY, just to change batteries in many things requires a screw driver, let alone more complex things like accessing the inner workings of a freezer to see if the fan is frozen over- one of the most common and easy freezer and fridge fixes. Try to get magnetic screwdrivers, as these are much more convenient and help you not lose screws. Plungers are also a must have, are very cheap, and they can prevent needing to call a plumber for certain things that are very simple fixes, either in toilets or sinks. I recommend at least two plungers- one for toilets, one for sinks. Buckets– I assume everyone has one of these already, for mopping floors, at the very least. But they are also useful in a DIY type setting like if you want to empty a clogged drain and don’t want the water pouring everywhere when you unscrew the pipes. While you can manage to get by in life without these, they are very very useful tools if you want to do any type of DIY, and fortunately they aren’t generally expensive either. Highly highly recommend getting all of these. Tape measures are super important, especially if trying to build anything, fix things, or even if you want to buy new furniture for your home and want to make sure you have enough room. Of course these can also be used for sewing, which I’m not counting as DIY for the sake of this post (even though it is). Hacksaws are much more useful than any other types of hand held saws, in my opinion. Growing up we had a standard hand saw and the blade was flimsy and moved from side to side, making it really hard to cut with. A hack saw’s blade is held firmly in place by its frame, and when it gets dulled, you can easily replace it with a new blade. There are also different types of blades for cutting metal, wood, plastic, etc… making this a good multipurpose tool. Utility knives are important for so many different tasks. I suggest getting a utility knife with retractable blades that can be broken off to expose new sharper blades. Adjustable wrenches are the best types of wrenches to have. While I don’t like using nuts and bolts and avoid them if I can help it, a lot of things that come needing to be built have nuts and bolts (like bunk beds we’ve put together) and need wrenches to open them up. Bikes also generally have nuts and bolts that need opening up to fix or adjust. Wrenches also end up being pretty important when trying to do your own plumbing jobs. While you can have a full wrench set with many different sizes, it is much easier to just have one adjustable sized wrench instead of a whole set of them. Socket wrenches are also pretty necessary for certain projects, but you can do without them, and especially if you plan on getting a drill, they become nearly obsolete. If you don’t plan on getting a drill, buy an socket wrench. Lock pliers are useful especially when you need force to turn something. They clamp pretty hard down onto things and come in handy, according to my husband, even if I never use these. Needle nose pliers are handy little buggers, and help you reach things in places where your fingers can’t easily fit. I have a portable metal shopping cart, and I learned that I can simply replace the axle when it bends instead of buying a new one, and I needed needle nose pliers to take out the pins holding the axles in place. Snakes, the plumbers kind, not the animal, are very useful for clearing up clogged pipes. While there are really expensive, electronic types, you can buy hand held ones in different lengths and this should be enough to clear up most clogs, saving you from needing to call a plumber. Gloves– I actually never use gloves for DIY, but most people like them, as they help prevent callouses and other injuries from DIY work. Safety goggles are helpful to stop getting things like sawdust into your eyes. Wood glue is handy for making wooden crafts, especially to use in addition to screws and nails. Get these, please. Yes, you can manage without them, but you’ll thank me. Sand paper is really annoying to use, in my opinion, but unless you want to be getting splinters, all wood should be sanded before use. Sanding is also important before painting upcycled wooden furniture- it helps the paint stick. These are awesome things that are definitely worth the extra. Laser distance measures, also known as electronic tape measures, save time and hassle when measuring things, and are more accurate than the standard tape measures. They’re definitely in the nice to have category and not necessary at all, but I like them, and they aren’t too pricey. Adjustable clamps make life easier if you’re doing DIY type work and don’t have a helper to help hold things in place. Staple guns are very useful if reupholstering furniture, as well as for many other things. If you’re serious about doing things yourself, over time you will save so much more than you spend with these tools. Yes, it is possible to DIY without these tools- for ages people built everything from scratch without electronics. However, the reason it is worthwhile to spend the money on electronic tools is because they save so much time and energy, making it simpler and faster and therefore more likely for you to attempt the DIY projects, because doing such projects won’t be as physically taxing. If you want to start with electronic tools, these are the first two you should get, as they have the most range of uses and will be most useful. Drills– are such life savers and make so many other hand held tools unnecessary, as drills have so many different attachments, from screwdriver attachments to drill bits to wrench attachments, and much more. Mike recommends that if you buy a drill, make sure it is an impact drill instead of a regular drill. A regular drill only turns, and an impact drill knocks in a circular motion, helping drill stubborn things, and has much more power than a standard drill. The difference in price isn’t that tremendous- a regular drill can be bought as cheaply as 25 dollars while an impact drill can be bought as cheaply as 45 dollars. The extra 20 dollars are extremely worth the energy they’ll save you, hence Mike’s recommendation . Mike says, though, that it is useful to have a regular drill as well- if you’re working with delicate wood, a regular drill allows you to slow down the drilling so that you don’t make cracks in the wood. Hand held circle saw– sawing can be quite exhausting if doing it by hand. There are a variety of different types of electronic saws, but Mike says that for beginners, and especially if you’re looking for versatility, a hand held circle saw like the one I linked to will be most useful, and save you the energy in hand sawing. Angle Grinders are handy little buggers- they have a rotating plate that can be used for a variety of things. They have different attachments, some are blades that can be used in place of a saw. My husband uses his angle grinder to cut metal, but there are blades also that cut other things. Additionally, angle grinders have attachments for sanding, which makes sanding so much quicker and easier and not the annoying chore I remember from growing up. Oscillating Multi-Tool– One of my favorite tools that my husband has is an oscillating multi-tool which is a tool that vibrates very quickly and has many different attachments to do different things, from sanding to wood cutting and metal cutting. Personally, we use the oscillating tool most when we want to cut something in a very straight line, because with the oscillating tool we’re able to get a lot of precision especially because it doesn’t move fast as an angle grinder or circle saw, so we can guide it exactly where and how we want to cut things. Typically we use the oscilatting multi-tool to mark where we want to cut things, cutting a groove along the length, and then using an angle grinder or circle saw to cut within the groove- that’s the best way to make sure the cuts stay exactly where we want them to be. Reciprocating saws are similar to jigsaws, in that they go back and forth many times to cut something, as does a hand held saw. My husband isn’t happy with his jigsaw- he finds that it doesn’t like to cut in a straight line, the blade is always moving, and he doesn’t get the accuracy he desires, so recommends getting a reciprocating saw instead of a jigsaw. Table saws, according to my husband, can be problematic if you don’t get a more expensive one. When purchasing a table saw, make sure that it is one that doesn’t limit the size wood you can insert. The first table saw we bought only let us cut wood that was less wide than a 2×4, which, as you can imagine, wasn’t too useful. Look for a table saw that allows you to mark an angle or width that you want your blade to cut at. And there you have it. My husband might have a few other tools that I haven’t mentioned here, but these are the ones he regularly uses and therefore I’d say fall under the category of tools any DIYer needs to own. If you don’t know how to DIY, how to fix things, build things, or anything related to that, fortunately there’s a wealth of information out there online to teach you how to do things, including so many youtube videos that can help you. Of course, some people prefer to go to courses- I have a bunch of friends who took a local handy-women’s course, but don’t despair if you don’t have the money or availability to go to something locally- the internet really can teach you everything these days. I have faith in you! Are you or your spouse/partner the type to do things yourself or do you generally hire a handyman or woman to do these things? 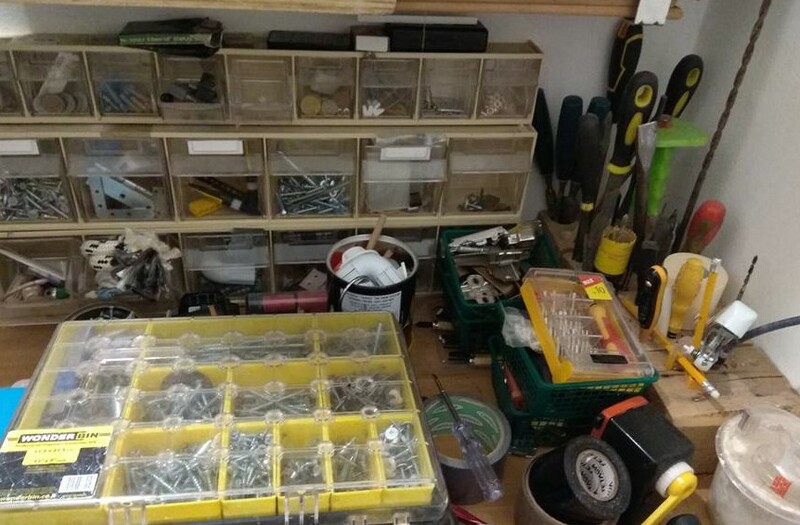 What tools do you have at home? Any items from my list that you want to purchase/had been thinking of buying? What tools do you consider must haves- do you think I’m missing anything from my list?